2018 has been incredibly busy, but in all the best ways! We are more than mid-way through this year, so it is the perfect time to look back and assess our accomplishments. Amidst the busy pace of the Global Leadership Program, our full time staff continued business as usual in our Ghana office (where business as usual is working extremely hard and doing amazing things). The skies have become cloudier, the days cooler, and the roads wetter as rainy season starts to pick up here in Tamale. This is a perfect time to pause and reflect on the year so far and the incredible things the team has been able to do. During this time of muddy shoes, wet roads, and once-dry dugouts brimming with water, we have decided to put implementations and scouting on hiatus until the start of the dry season. 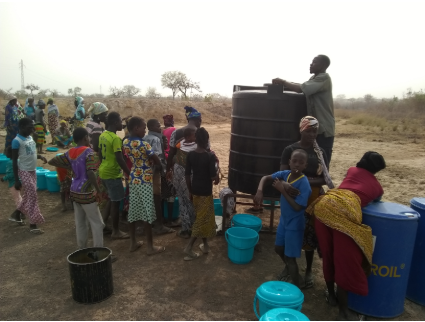 Businesses during rainy season are understandably very slow in many communities because any family with a tin roof is collecting rainwater at this time and doesn’t need to buy additional drinking water as frequently. 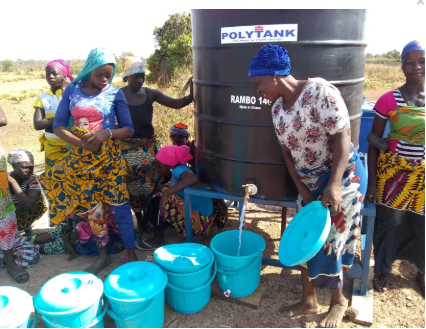 We found that it is best for new businesses to start off strong during the dry season, when demand for clean water is much higher. Additionally, during the rainy season the roads can be difficult or impossible to traverse (especially the unfamiliar ones that our scouters venture on)! 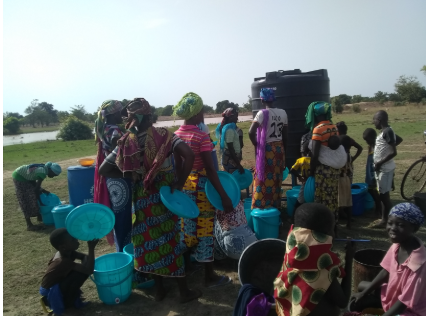 For scouting new villages, the rainy season makes it a challenge to accurately assess access to clean water, since there is an abundance of water right now. So it makes the most sense to take a little break from implementation and scouting. Fret not, we still have plenty of other activities for our staff to work on during this time: Annual Surveys, Updated Household Lists, Children’s Educations, Research & Development, etc. There is never a dull day in the Saha world and there is always more to be done! Continuous improvement! First, I’d like to have a shout out to the Scouting Team. Without them, we wouldn’t have found the villages we implemented in this past year. Our goal was to scout 100 potential villages this year and we are at 93 already! 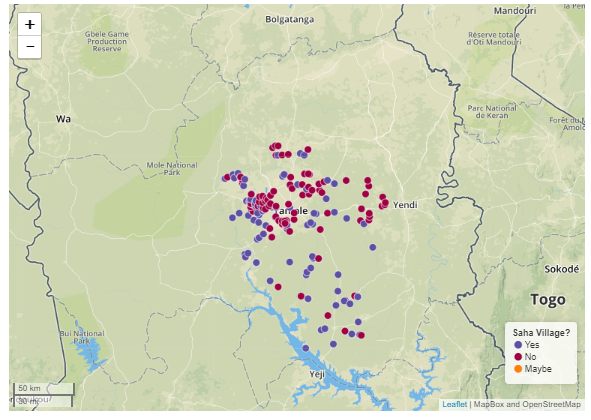 We’ve scouted and mapped nearly every village within a 3-hour moto-drive-radius from Tamale. Incredible! Coming out of the rainy season, we will see if there are any ‘hidden’ villages out there yet to discover! Villages scouted this year so far! With our Implementation Team we are able to implement new businesses in more villages at a faster rate outside of the Global Leadership Program. Our slogan for this year is “18 for 18!”, or in other words, 18 Saha team-led implementations for the 2018. For anyone keeping track, with 10 GLP villages that will bring us to 28 new villages this year! In the first half of the year, this mighty team has implemented 9 new water businesses, half of our goal!. Since this is our first time having an Implementation Team, we are still working out many details and it can only get better with each iteration. We developed an Implementation Handbook for the team to reference during their implementations. There is a lot to remember, especially for just one person. Having someone come to help during distributions helps a lot! The days can be long and we want to make sure that Implementers continue to have the same energy and enthusiasm in household 1 as they do in household 101. 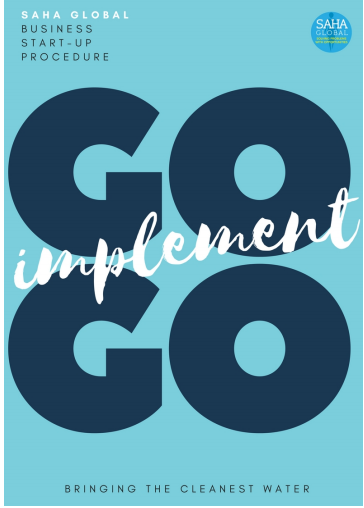 The implementation book is helpful to remember all the little details that goes into implementing. Always check at the end of the day if there was anything you’ve forgotten to do. The larger pictures in the handbook are a favorite feature for pitching the idea to the community, and the laminated pages make them more durable. We can take our time training the women. If we don’t think they understood it the first time, it is okay to go over it again, and again if needed. We aren’t in the time constraints of the GLP, so we have the freedom of a more flexible schedule. For larger communities it is okay to have more than one opening days! It’s better to plan ahead for them, so people don’t show up and leave with empty buckets. 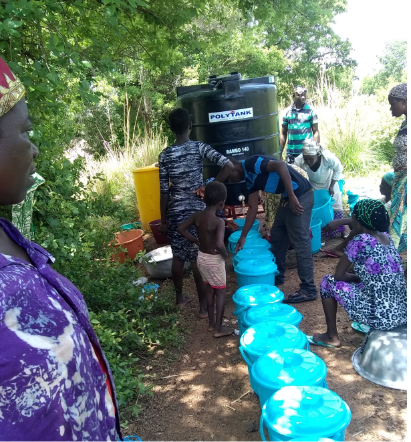 Implementation Team Handbook: A new tool to help us bring the cleanest water to all of Northern Ghana! Below is a summary of all the new communities implemented by our team this year and the women entrepreneurs we’ve introduced to the Saha Family! Village Name: Implementer Opening Date Population Who are the entrepreneurs? Tunga Daborpe Shak 4 May 28, 2018 223 Rashida,Ayisha,Asana,Rabi and Maina. 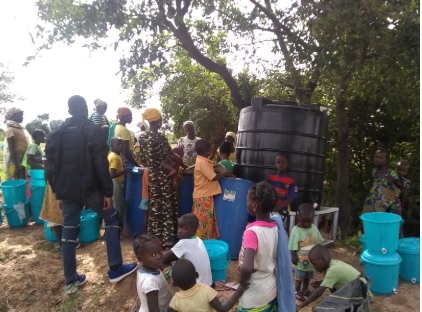 Nangbagu Shak 5 Jun 19, 2018 255 Memunatu1 , Memunatu 2,Rahama,Adija and Mariam. Kpalsogu kuraa Eric 5 Jun 2, 2018 479 Ibrahim Atika,Haruna Salamatu, Sulemana Amatu,Baba Fatima,Abdulai Agatha,Kpanalan Awabu, Yussif Sanatu,Aku Amina, Mohammed Hawabu. Long lines at Jagbo Tindang’s opening day! Making the first sale ever in Tunga Daporbe! 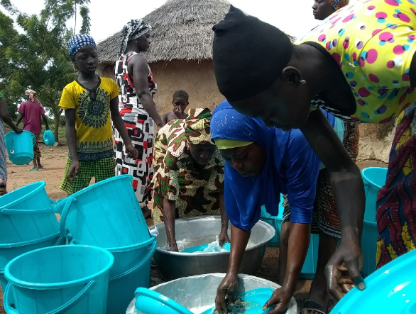 Now these communities are being monitored weekly by our Monitoring team who is helping to provide additional support and training for the women entrepreneurs and communities. There have been small but impactful improvements from the Office that has made managing all three teams more, for lack of a better word, manageable! To updated expense reports to gas cards, all these little things add up to big changes and allowed us to be able to have the capacity to do more. We are currently preparing different workshops to help build our team’s knowledge and skills sets: Financial Training, Human-Centered Design, and Lab Training. These are the ones we’ve already gotten started, and there are still more in the pipeline. I am so impressed by the hard work of the team and how much we’ve been able to accomplish in this half year alone and I look forward to even more we can do in the second half of 2018! The future sure is bright here at Saha! 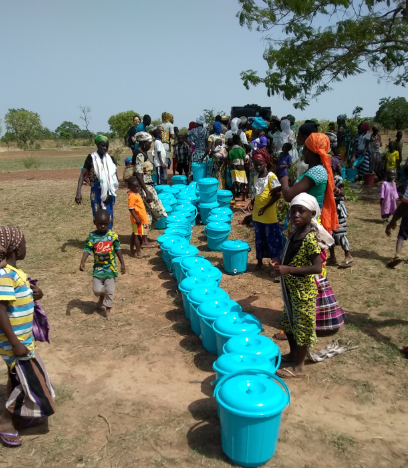 Saha Global gets the cleanest water to the poorest people. 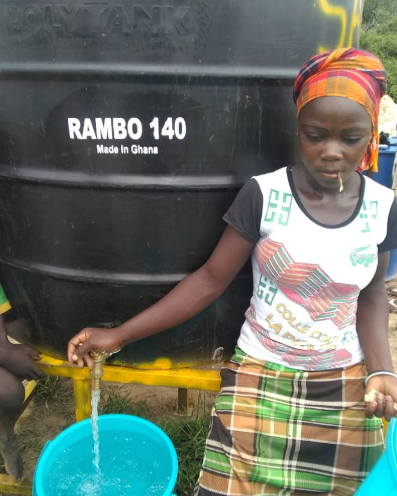 We work in rural Northern Region Ghana where we set up entrepreneurial women with chlorinating businesses that provide clean water that all can afford. 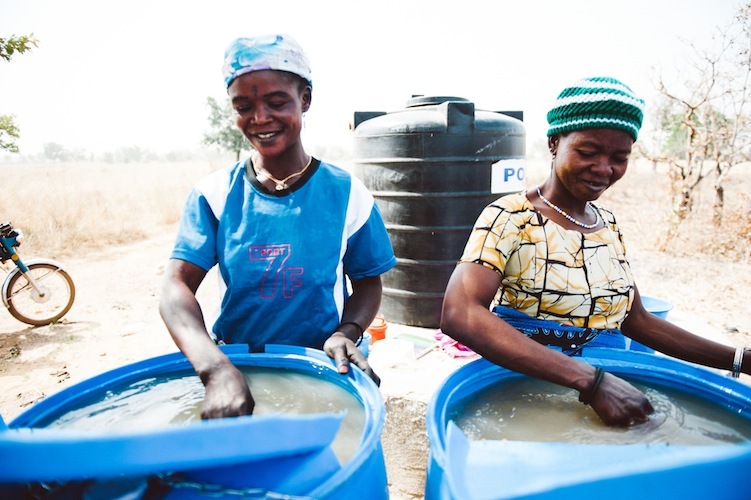 To date, we have trained 378 women entrepreneurs who have launched 134 clean water businesses that serve approximately 62,458 people. 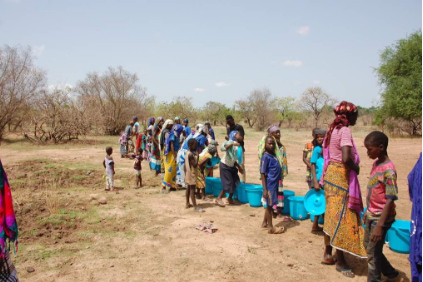 It costs Saha $13 to bring clean water to one person.